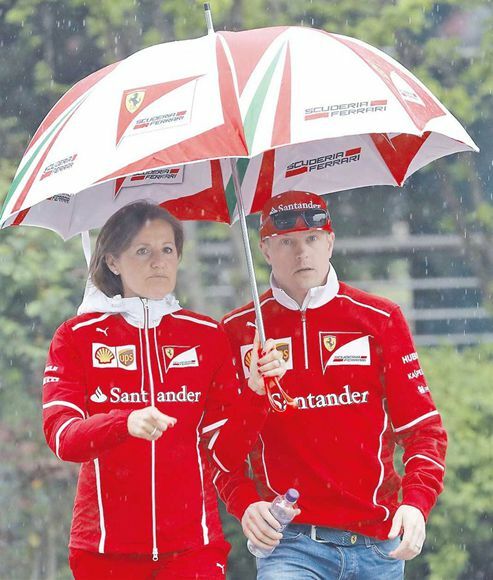 Ferrari F1 driver Kimi Raikkonen of Finland walks in the rain at the Shanghai International Circuit yesterday. The Chinese F1 Grand Prix will be held this weekend. Ferrari driver Sebastian Vettel has tipped Mercedes as favorites to win the Chinese Grand Prix in Shanghai on Sunday even after his victory in Formula One's season-opening round in Australia. "I think Mercedes still has to be the favorite, obviously," Vettel said yesterday. "We know that we have a good package which puts us in a strong place but ... we know there's a lot of things that we need to do to keep up with them and keep the position that we are in now, to fight for good races." Vettel beat Mercedes pair Lewis Hamilton and Valtteri Bottas by a comfortable margin in Melbourne two weeks ago. Hamilton, who started from the pole position, appeared to have the edge over the German in qualifying but the Ferrari appeared genuinely faster in race trim. Vettel's win in Australia was Ferrari's first since September 2015 and first in a season-opening race since Bahrain in 2010. It raised hopes that the Italian squad could challenge Mercedes for the title this season and end the Brackley-based outfit's dominance that has seen it sweep to a hat-trick of drivers and constructor' titles and 51 wins from 59 races over the last three years. "It's the first race, so it doesn't mean much," Vettel said. "But for sure, as I said, it's the best way to start off." Mercedes has a strong record around the 5.4km long Shanghai track, winning four of the last five races at the circuit and starting each one on pole position. Hamilton, too, has won in China four times, more than any other driver by far. He is also the only man to have enjoyed back-to-back success at the track, and Vettel could be right to be wary. But he hasn't ruled out the race throwing up some surprises, especially if the rain forecast for Sunday arrives. "It's always a Grand Prix full of surprises," said the 29-year-old, who handed Red Bull it maiden F1 triumph in a wet race in Shanghai in 2009. "You never know what happens around here." Hamilton, meanwhile, said he relished the prospect of going "wheel-to-wheel" with Vettel. Recalling his go-cart racing days, the three-time champion called go-carts "the best form of racing because it's wheel-to-wheel all the way form start to finish." "I yearn for those kinds of battles. I'm dying for that day to come again and I hope that happens with me and Sebastian," he said. "It fuels the fire even more," Hamilton said of the Australian loss. "We want to be the ones at the front and we've got a real fight on our hands. It makes you want to focus on all the weak spots more." The season-opener in Melbourne typically saw few overtakes, with the aerodynamics of the new, wider F1 cars making it tougher to pass on the tight Albert Park circuit. But at Shanghai, the season's longest straight of 1.17km should provide a better opportunity for the quickest cars to streak ahead. Ferrari has shown impressive early pace, with 2007 champion Kimi Raikkonen taking fourth and all the signs point to another tight battle between the two top teams in China. "Its only the second race, so I can't predict what will happen," said Hamilton, adding that he hoped the season turns out to be a "close battle the whole way."